Outdoor Courses for Scrambling, Climbing, Kayaking & Mountain Activities: Winter Skills, Winter Scrambling & Winter climbing courses 2012/13. Winter Skills, Winter Scrambling & Winter climbing courses 2012/13. The winter season continues here in the uk with many people getting some great climbs done on Scottish winter routes or enjoying winter walking both here in The Lake District and in Scotland. 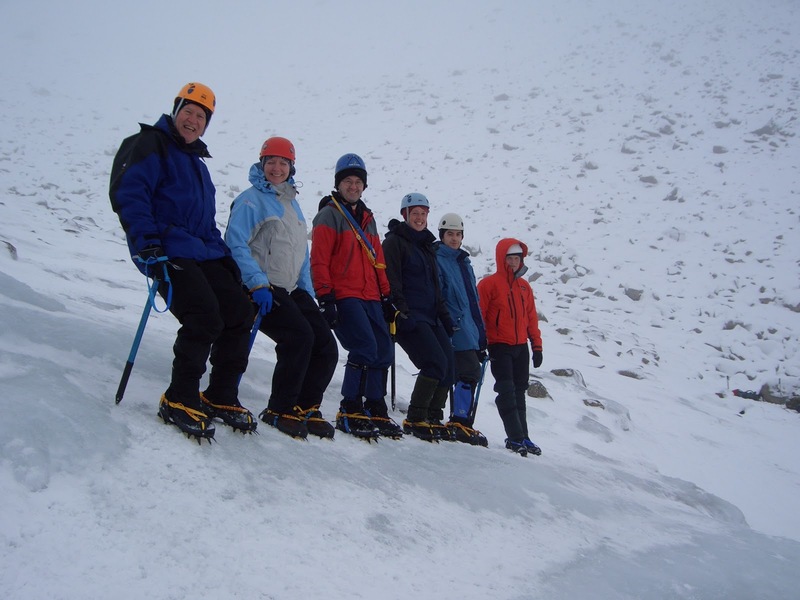 Kendal Mountaineering Services is here to help you make the most of winter in the mountains. For budding newbies to winter in the mountains - why not try one of our Winter Skills Courses (photo one). Here you can learn how to use an ice axe & crampons under the supervision of one of our instructors and be taught how to interpret snow conditions as well as building an emergency shelter or snowhole for a night out in the mountains. We are offering our winter courses in The Lake District as well as Scotland and you can join a basic 2 day winter skills course for only £110 per person. You can read about about a previous Scottish based course here. Not everyone wants to join a group to learn winter skills, winter scrambling or winter climbing - indeed our winter scrambling & winter climbing courses are run on the ratio of one instructor to no more than two clients. However, on occasion people want to learn skills on a one to one basis where you can pick as many or as few days as you like with one of our qualified staff. Of course the answer is yes and instruction doesn't come any better than this! Do contact us if you wish to to enquire about our bespoke winter mountaineering or climbing experiences. Benn Berkeley did (photo two) and in early 2012 enjoyed a great 12 day course learning all of the skills required to be able to lead winter routes up grade II in standard having started from a fairly basic background. During his course we visited many of the main winter climbing areas including Glen Coe, Ben Nevis, Creag Meagaidh and the northern corries of The Cairngorms. You can read all of the reports from Benns great winter mountaineering & climbing experience by refering to our blog here. We have recently run a bespoke winter mountain Training course in the Ben Nevis area for Everest Summiteer Paul Quinn from High Altitude Ireland. Paul plans to ascend Gasherbrum I & II in the Summer to raise money for charity and you can visit his website here. If you would prefer to be guided on some winter climbs or winter scrambles then contact us to discuss your requirements. There are currently great winter climbs and scrambles to be done both in The Lake District and in Scotland. If you are interested in trying a classic winter climb in The Lake District then contact us to discuss your requirements. If you are interested in climbing or scrambling in Scotland then Glen Coe, Ben Nevis, Aonach Mor, Creag Meagaidh and the Cairngorms are areas where many great routes are to be found. These include routes such as The Zig Zags, the Aonach Eagach or Sron Na Lairig in Glen Coe, Ledge Route or Tower Ridge on Ben Nevis or Daim Buttress on Aonach Mor to name a few if you fancy trying a classic winter climb. Photo three shows two of our clients about to top out on Green Gully - a great introduction to grade IV ice on Ben Nevis where of course there are many other fantastic winter climbs of all grades. Let us know your climbing aspirations both in terms of grade and location and we will choose a route to suit your ability. By checking out our blog you can read about all of our winter courses from 2009 until the present time by browsing from January through to March each year - enjoy reading! Prices for our winter courses are listed here on the website. If you have any specific questions or bespoke requirements then please do not hesitate to contact us. We look forward to working with you.